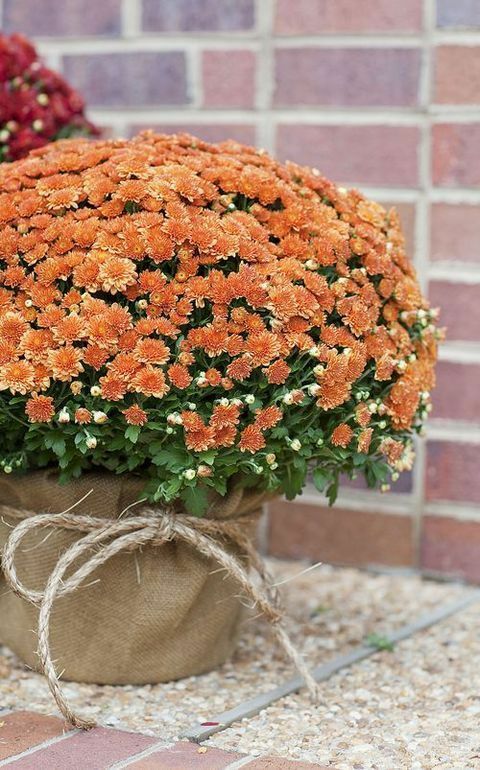 Mums, School Spirit, And Fall Color: Beauty In The Fall With Miracle-Gro! This is a Sponsored post written by me on behalf of Scotts Miracle-Gro. All opinions are 100% mine. The first and very slight hint of fall has arrived in the deep South. Mums, school spirit and fall color beauty in the fall with Miracle-Gro decorative times are upon us. Front porch preparations have begun. The front entry is primed for pumpkins, the rockers have received a fresh coat of paint, and fall Chrysanthemums have been potted. Chrysanthemums immediately signal three fall essentials to me- Fall gardening, decorating and school spirit. Mum is always the spirited word in our fall football planning and decorative planting conversations. These perennial favorites of fall give good color, long life, and create garden or container wow factor. 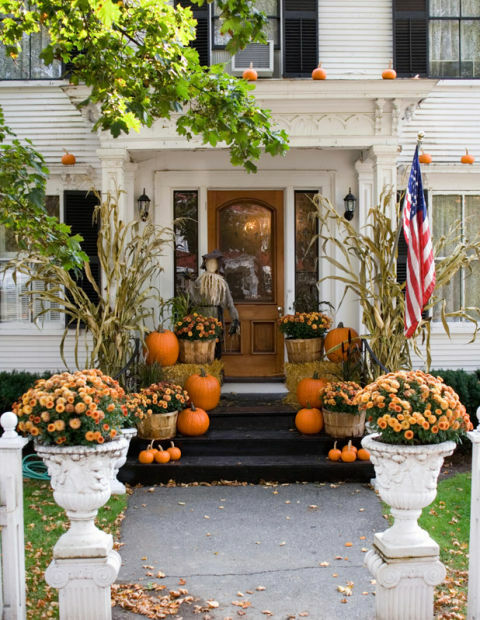 Fall and tailgating tablescapes as well as front porches love a potted mum. A swoon worth fall porch decked out in fall colors captures the essence and simplicity of fall beauty. 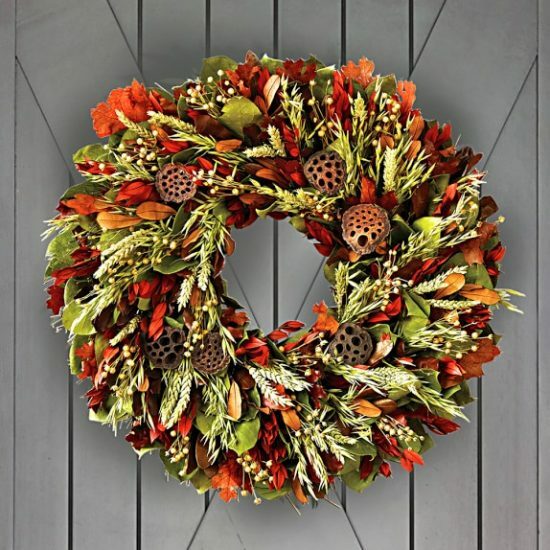 Pumpkins, mums, color, nature, and burlap come together as fall decorating essentials. 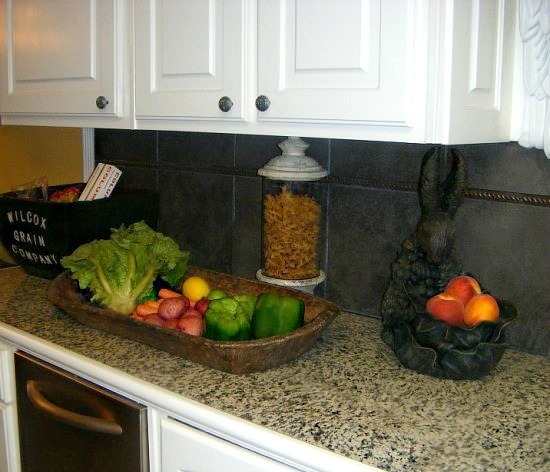 Burlap bags make an inexpensive and natural alternative for the container cover. Place potted mums in the bag, pulling up to top of container. Gather the top, loop the ties, and finish with a loose knot. Pumpkin groupings in odd numbers add depth and height. Natural elements such as Magnolia leaves and branches bunched together offer texture and round out the fall color palette. The theme of go big and go home fall gardening follows through with the helpful find beauty in the fall information from Scotts Miracle Gro. 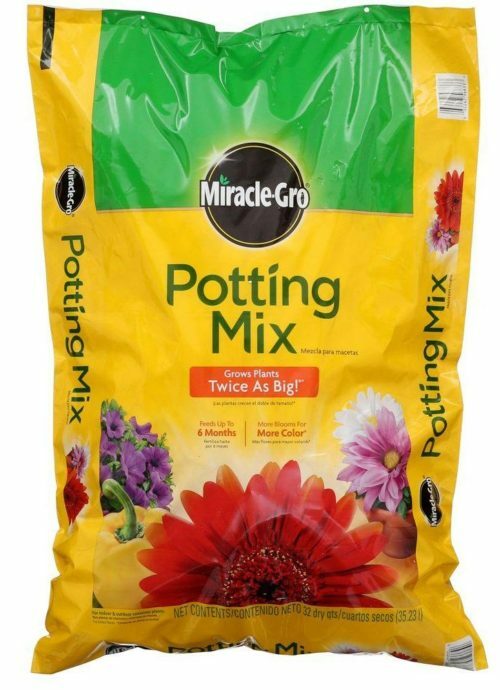 Miracle Gro Potting Mix is ideal for all kinds of container or potted plants. I like that it feeds the plants for up to six months with Miracle Gro Continuous Release Pant Food and improves healthy drainage and air flow. 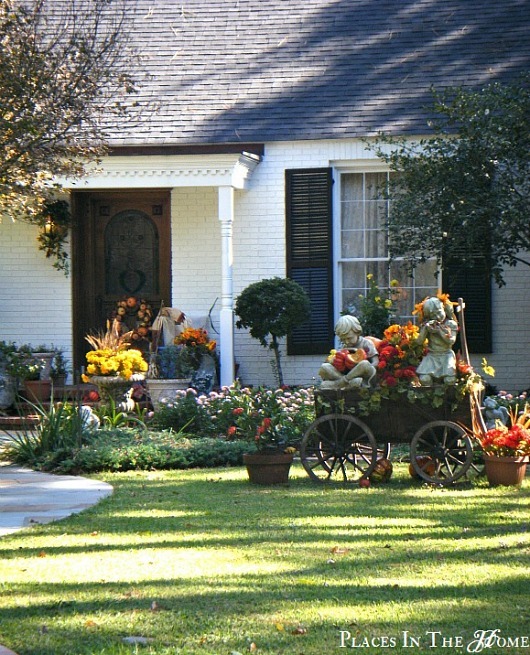 Mums and ornamental vegetable containers enhance the landscape of fall. Miracle Gro Potting Mix boosts the look and life of fall bedding, container, and garden plants for optimum visual and edible results. If you like gardening you will be in good company when you “like” the Miracle-Gro Facebook page. Fellow fall gardeners discuss and share gardening tips, herb suggestions, and pictures of their harvest and plant success stories. It’s a growing trend! Author Places In The HomePosted on September 15, 2012 April 15, 2017 Categories fallTags lawn and garden1 Comment on Mums, School Spirit, And Fall Color: Beauty In The Fall With Miracle-Gro! 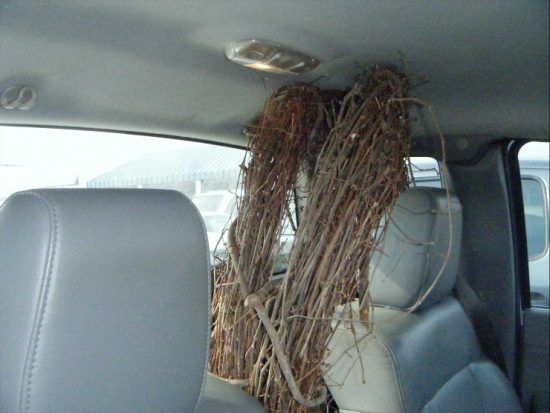 Tuesday afternoon I went on my Halloween Hobby Lobby run. Dollar Tree, Walmart and Marshall’s got in their fair share of “counseling” on my fall, Halloween and Thanksgiving retail therapy session. I decided to make an afternoon out of it. With camera in tow I made a stop by a couple of my favorite October haunts. You know when you have one favorite house that you love to ride by and admire? This is mine. It is located one street over from our old house. “Drive by the cottage” became a weekly request in our drive time routine. We had the opportunity to purchase the house a few years ago. We knew we would be purchasing my childhood home from my parents as soon as their new house was completed, but the minds of these two residential flippers stay in buy, renovate and sell mode. As it turned out it would have been too much of an undertaking. 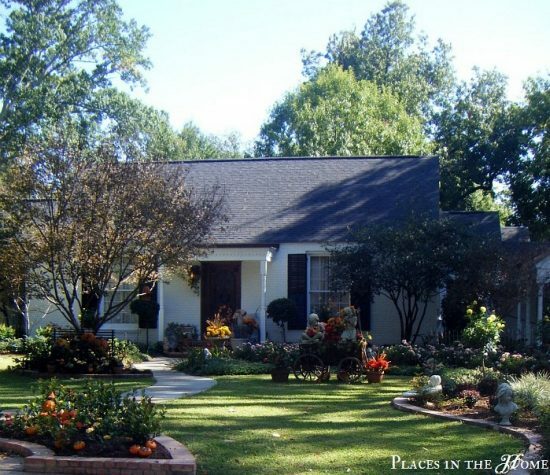 A lovely couple did purchase the house, gave it plenty of interior and exterior TLC, and have provided me countless afternoons and evenings of drive by enjoyment. 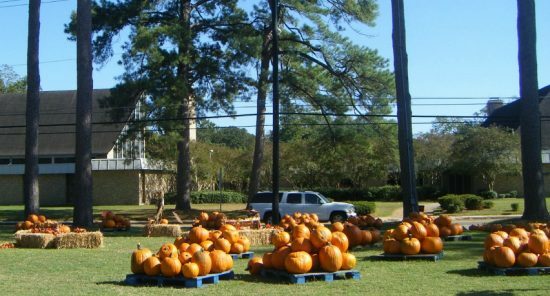 The pumpkin patch is also located in our old neighborhood. I guess you could say I was walking (driving, in this case) down memory lane. I like to revisit the neighborhoods we have lived in over the last twenty years and the memories we made there. This particular Tuesday afternoon fall decorations and the pumpkin patch were on the agenda. My afternoon outing took a retail turn at this point. Halloween treats and tablescape accessories awaited me at Dollar Tree, Hobby Lobby, Marshalls and Walmart. I found exactly what I wanted for my Halloween tablescape and a few extra goodies I had to have! I never know what I’m going to Marshalls for. 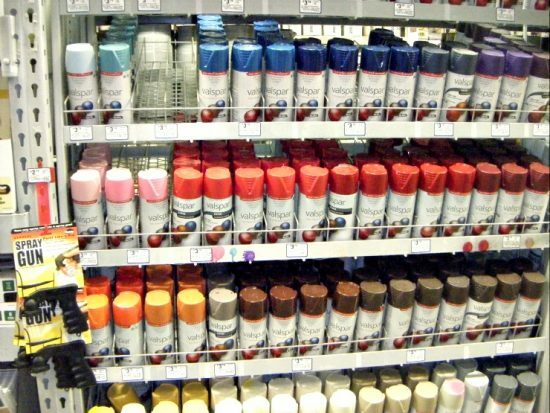 Inspiration doesn’t hit until I see the item in the store. 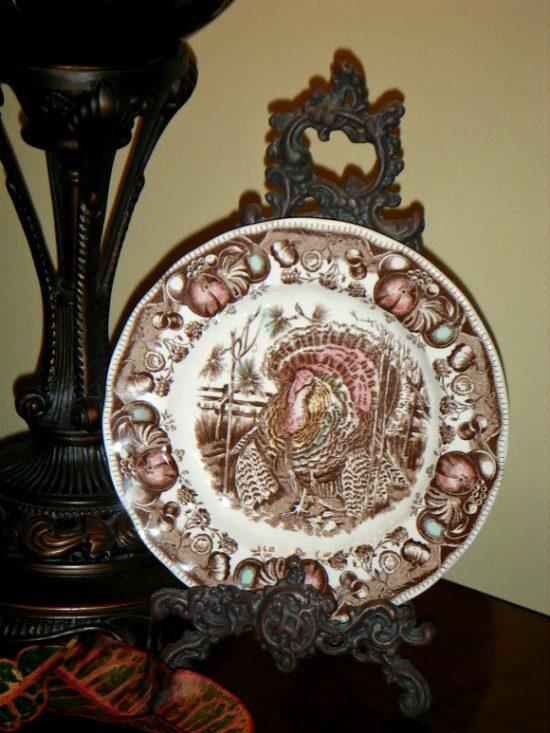 I am such a pushover for a turkey plate, and this one caught my eye and my heart. I saw, I swooned, I purchased. Goodwill was on my way home, or at least I reasoned it was. 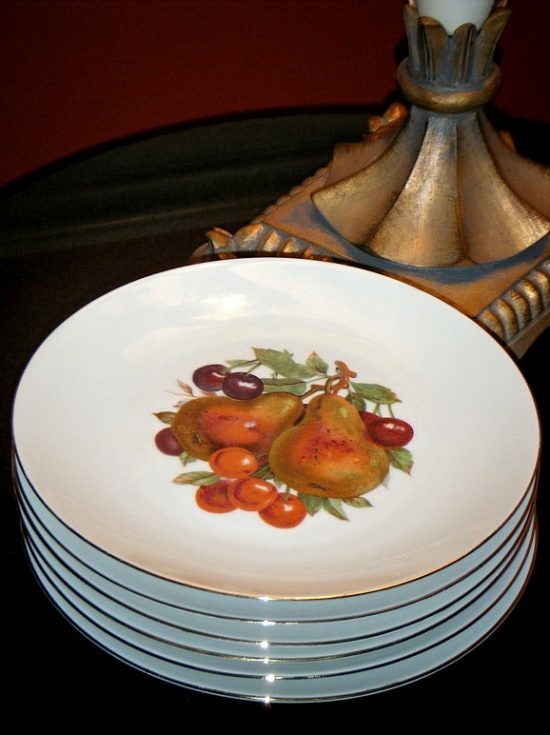 I didn’t know at the time I would find and not be able to resist the set of six(6) Bareuther Waldsassen Bavaria dessert plates for $1.00 each. Talk about a Halloween treat! It was a lovely fall afternoon for a drive, some shopping, and an unexpected Goodwill deal. Now comes the fun part, the Halloween decorating. I’m starting on the tablescape tomorrow. I can’t wait! I have discovered the perfect soup to prepare for the first weekend of fall. 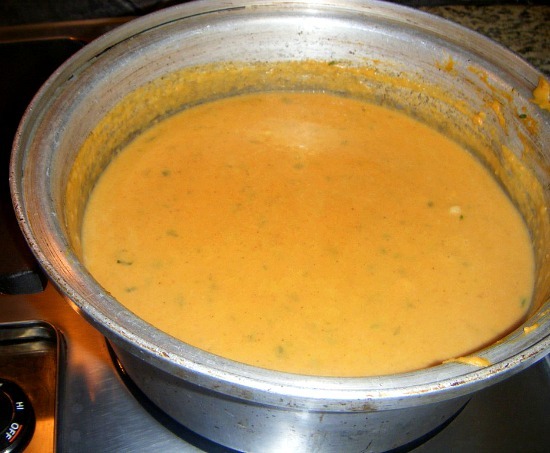 Sweet potato soup is creamy, rich and absolutely delicious. 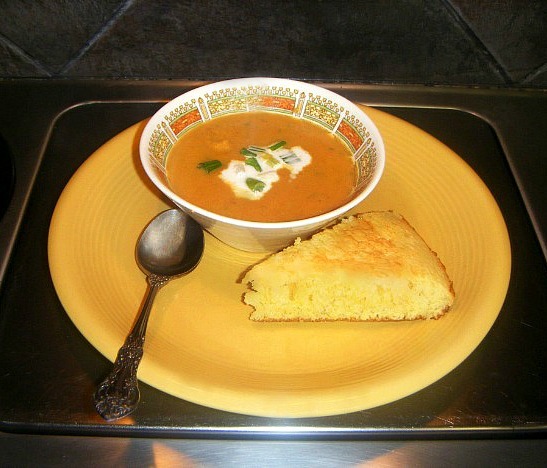 I served cornbread with it, and the two complemented the fall feel. My culinary skills shined tonight. This easy dish was met with the rave reviews! 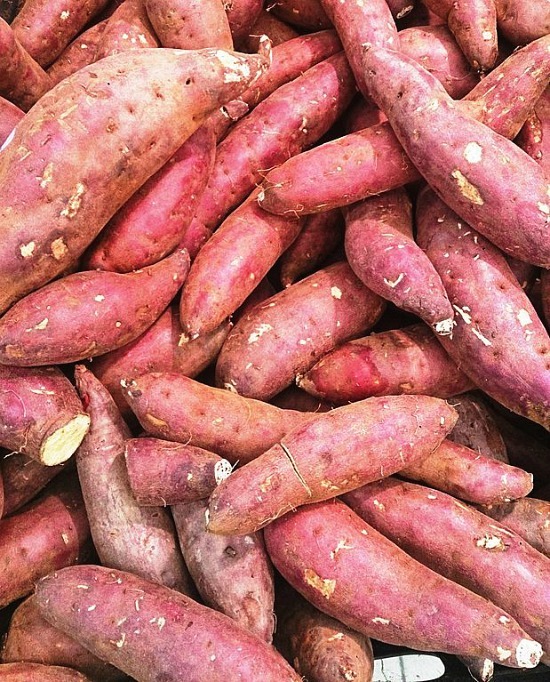 Microwave sweet potatoes for 10-12 minutes on HIGH power. Potatoes should be tender when done. Halve the potatoes. With a fork, mash out cooked potato and discard skins. 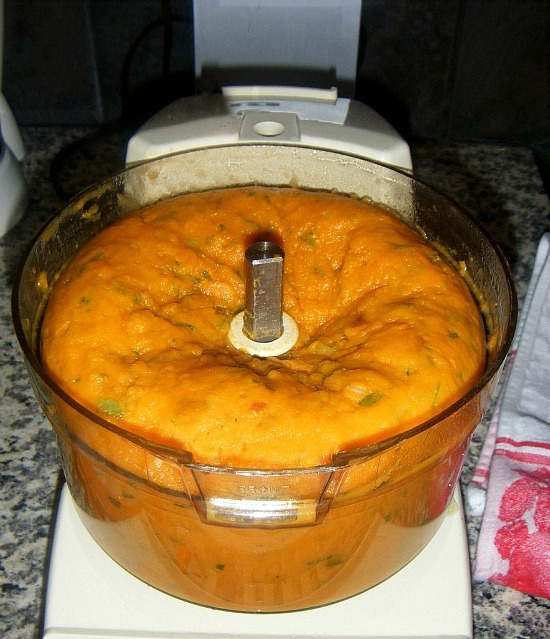 Process sweet potato mixture, green onion and half of the chicken broth (1 can) together in a blender or food processor until smooth. Add mixture to Dutch oven. Stir in remaining chicken broth, heavy whipping cream, salt, garlic powder, white pepper, nutmeg and cinnamon. Cook over medium heat, stirring constantly, until thoroughly heated. 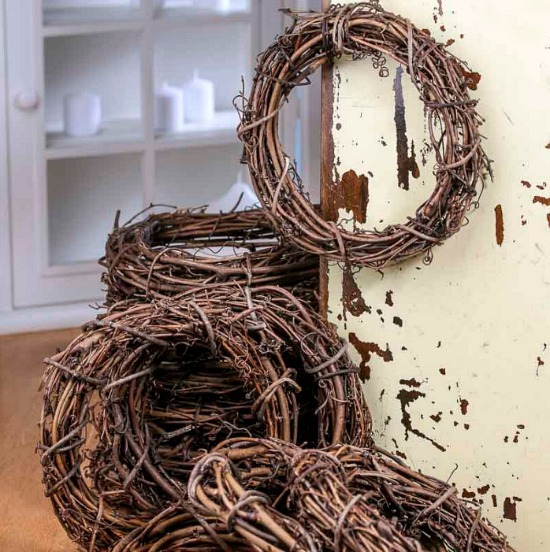 Holiday DIY projects are often only as good as the materials used. Sadly, we are retail deficient in my area of the world. Making the most out of what we do have continues to be a difficult kind of retail Sudoku. Like Sudoku, once you master it you breeze right through it. Thank the home improvement and arts and crafts powers that be for locating in my neck of the piney woods! Where there’s a Hobby Lobby and a Lowe’s… Now that the temps are tolerable, an afternoon out and about in the big city is a pleasure. DIY projects in mind? Check. 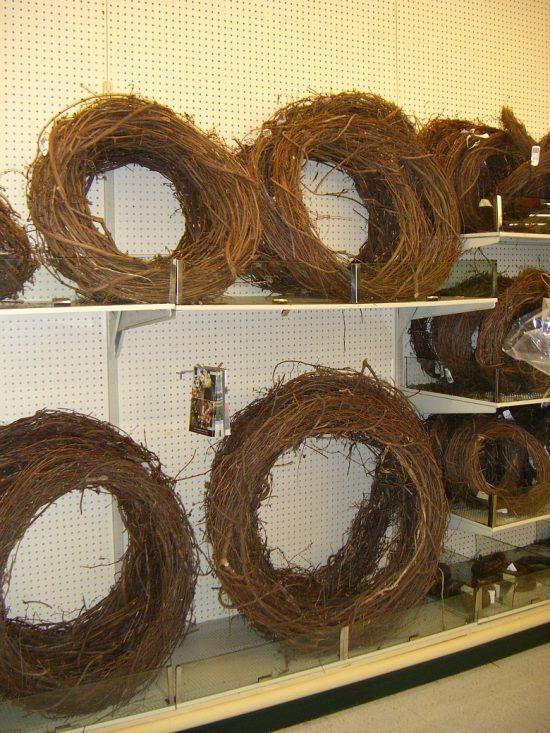 The calendar might say it is still summer, but Hobby Lobby says it’s the holidays! 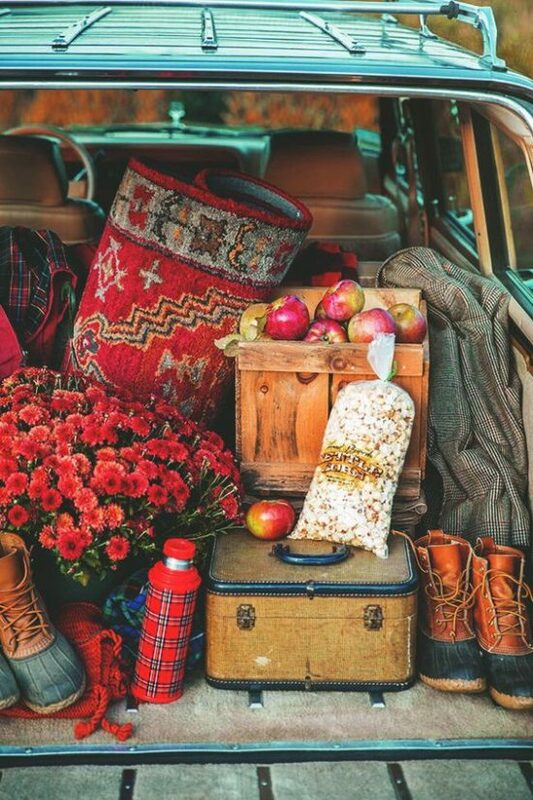 I am so excited for the It’s Fall Y’all autumn link parties! I have been planning for awhile. I believe I’ll be throwing my hat in the holiday projects ring with my fall mantel entry at The Lettered Cottage. This really looks like it is going to be fun! 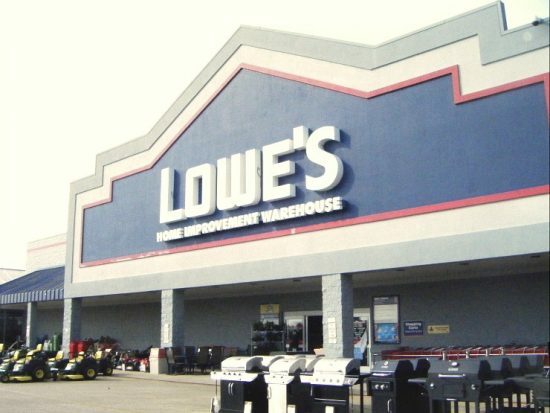 It is so convenient to have Hobby Lobby and Lowe’s located next to each other. I must remember to send thank you notes! My shopping cart runneth over and the ideas are flowing. Can you guess what the project is? Let’s just say I’m getting twiggy with it, baby! Temperatures, spirits and retailers all point to fall’s arrival. As a girl’s thoughts turn to fall home decor ideas so does the search for seasonal home decor items. Perfectly timed with the first day of fall, the Williams-Sonoma email I received this morning showcases fall colors, textures and patterns. Inspiration is everywhere, and the sights and sounds of fall make it very easy for this girl’s thoughts to turn to fall home decor ideas. 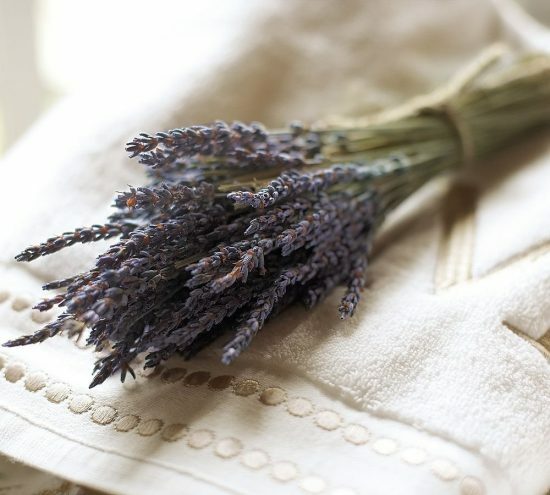 An aromatic dried Lavender bunch knows no season and is a visual goodie all year long. Dried Lavender bunches bring forth the ooh la la fragrant factor. Lately I’ve found myself growing more and more inspired to tackle a DIY twig & branch chandelier. I have a candle chandelier at the shop that I believe is the perfect canvas for my art interpretation or disaster. Hopefully it goes in the interpretation direction. Covering the chandelier in its entirety with twigs and branches and perhaps painting it with spray paint is what I’m initially thinking. 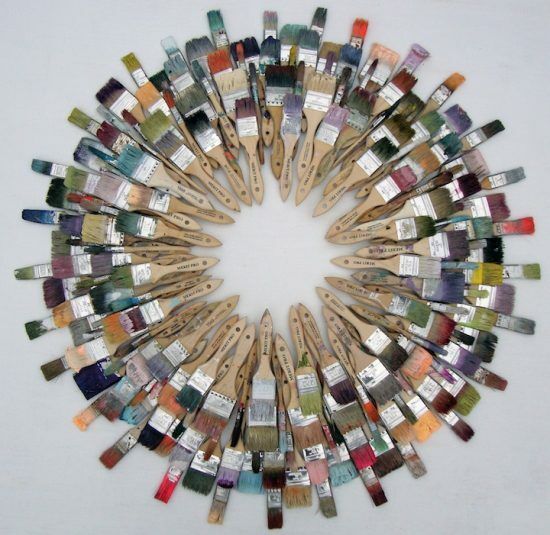 Color may lock the fixture into a specific palette, and leaving it in a natural state may better serve its purpose for fall and winter decorating. Keeping the fixture as a candle holder will make it holiday worthy and allow me to change the candles out to coordinate with seasonal colors. As I was cleaning out the refrigerator over the weekend (this girl really knows how to throw down a good time!) inspiration struck. My antique dough bowl has been used to house everything from magazines to fresh cut greenery, but oddly has never come in contact with dough. I retrieved it from the man cave coffee table, removed the magazines and remotes, and placed the veggies in it. It made both a pretty display and a pretty picture. A fall arrangement of pumpkins and squash, eggplant, mustard greens, red onions and snap beans awaits. I love an edible arrangement, and the vibrant colors of fruits and vegetables make great subjects for displays. I’m looking forward to the crisp fall temps, being able to hear the high school bands performing at the local Friday night football games from our front porch, and the home decor offerings of this wonderful time of year.